For cutouts - Panel does not require mounting frame or mounting holes. Stripanels can be wired and installed completely from front. Patented self-contained fastening device, "T-Nut", is permanently attached, simplifies mounting, holds tight. Patent No. 3046515. Thermocouple type and circuit numbers are marked on face of Stripanel with corresponding circuit numbers and polarity identification on the back. Stripanels are numbered starting from "1" unless specified otherwise. Panel bodies molded of glass filled thermoset compounds (will not melt) for high strength and dependability. 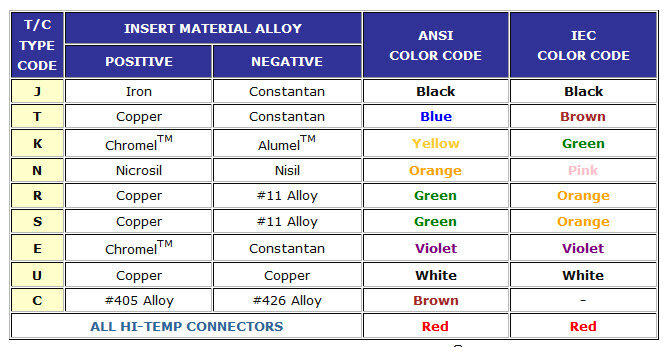 The color coded panels will withstand ambient temperatures to 400°F (205°C) continuous and 500°F (260°C) intermittent. 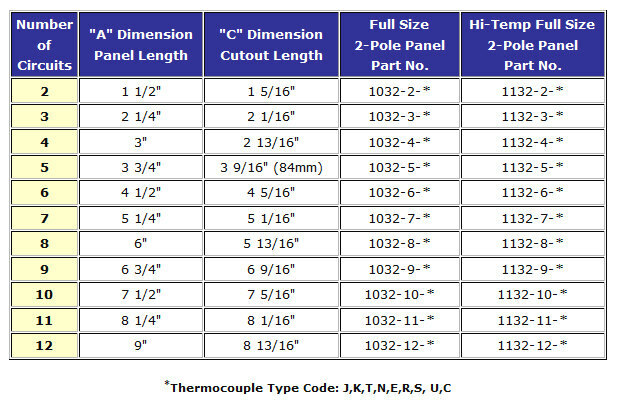 High-Temperature Panels (all Hi-Temp panels are color coded red) will withstand ambient temperatures to 800°F (425°C) continuous and 1000°F (540°C) intermittent. Click the button below to add the 2-Pole Full Size Panels to your wish list.